Home / News / Viral / People Got Mad at This Young Boy For Making Out With Someone But Were Surprised When They Saw This! People Got Mad at This Young Boy For Making Out With Someone But Were Surprised When They Saw This! Public displays of affection are generally frowned upon, especially in a country as conservative as ours. We often shake our heads and cringe when we chance upon couples making out and touching each other inappropriately in public places. However, some people’s voyeuristic tendencies are tickled when they see these kinds of acts. What do they do? They whipped out their cell phone and start recording the whole thing! 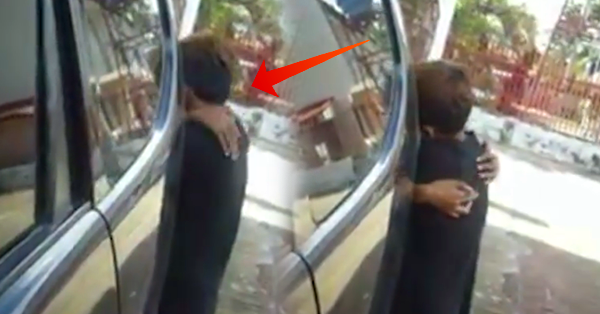 In a video that was uploaded by Facebook fan page ‘Filipino Vines,’ netizens were initially shocked when they saw footage of a young boy who was seemingly making out with someone behind a black car. The caption of the post was: “Tsk. Bata palang marunong na!” It was credited to Jay Max. The 15-second-long video garnered varying comments - from shocked to amuse. The first eleven seconds showed the young boy being grabbed by two hands. Moaning sounds could be heard in the background and the boy appeared to be kissing someone passionately. However, during the latter part of the video, the boy comes into full view. Anil Binal: “Hahahaha... Ang Lupit mong mag sarili totoy, lupit mo pa actor sa pelikulang nalugi sa Bandang kalagitnaan ng Oscar.. “ with three laughing-with-tears emoji. Wonder what they were all commenting about? Watch the video below! What do you think? Did it shock you? What was your reaction? Tell us in the comments section below!